Florence, Italy’s STINS have managed to produce a prime album with “Through Nightmares and Dreams” out on Red Cat Records. No frills or no fancy rock here. Just straight up dirty rock and roll with a splash of metal occasionally thrown in. Listening to “Through Nightmares and Dreams”, its difficult to truly pinpoint the STINS influences. Clearly they are an amalgam of classic rock, 90’s indie rock, and possibly AC/DC. However, that is not to take away from the STINS, as they have a sound all of their own. Rounded out by Giulio Nencini on vocals, Manuel Vuono and Lorenzo Matteuzzi on guitars, Andrea Devoti on bass, and Andrea Del Francia on drums, the STINS make sure to leave a lasting impression. Album opener “Drown into You” starts off beefy and does a great job at setting the tone for the album. The bass playing by Devoti is churning, frantic and has punk vibes. Great tune and awesome job by drummer Del Francia by adding double bass to the song. That really is the difference maker throughout “Through Nightmares and Dreams”, subtle bass lines and double bass on the drums take it to the next level. “All I Want” is another catchy song with outstanding bass lines while Vuono and Matteuzzi channel their inner Iron Maiden. Very memorable. “Ride My Skin” brings the AC/DC vibes. Catchy, fun, and really needs no explanation as the title suggests. “Black Lily” is an up-tempo rocking good time. Again, those bass lines and double bass drumming really shine on the production and is what sets the STINS apart from radio rock. Another strong track. “The Chaser” starts off reminiscent of Judas Priest and Iron Maiden. Nencini’s vocals take command here with a super catchy chorus. Easily one of the best tracks on the album. Again, cannot stress the amazing job bassist Devoti and drummer Del Francia make! “Adolescence Coalescence” is a throwback that sounds similar to the Clash. Old punk vibes that rock. “Billy Goes to School” is a bit of an anomaly on the album. However, I mean this in the best way possible as the STINS do their best Faith No More impression. Again, not a bad thing. “I’m on Fire” is another catchy tune that sounds like it could be from the mid 90’s. Album closer “Everything or Anything” is a perfect mix or classic and modern rock. That bass line though…definitely a standout song. 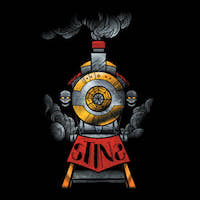 The STINS have spewed forth the spirit of rock and roll with “Through Nightmares and Dreams”. With ten tracks at 36 minutes, this album is all killer and in your face. Perfect to listen to while on a road trip. The STINS might not be reinventing the wheel, but with their brand of rock, who cares? Perfect for fans of AC/DC, classic and modern rock and roll with a heavier twist. How about that bass! ?